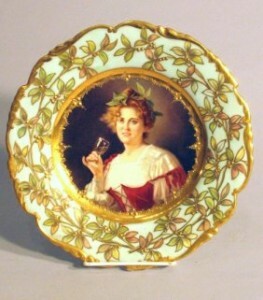 This late 19th-century portrait plate could be worth as little as $35 or as much as $600. How to know? It’s all in the marks. The process of identifying any item examined by an appraiser is based on a number of identifiers. In the case of pottery and porcelain, it often involves looking for manufacturing and company markings, many of which are well documented and some with only the barest of references. I’m going to take you through the process. The plate in the first image is what’s generally referred to as a “cabinet plate,” meant for as a decorative display piece rather than for regular use. To appraisers who routinely works with such pieces, they know what they’re dealing with right off the bat by looking at the face of this plate: a late 19th-century plate with origins possibly in Germany or Austria. But professionals always use due diligence and follow their own protocol to verify their first impressions. The importance of a proper identification cannot be overstated, as values for items like cabinet plates vary tremendously. A plate described as a “late 19th-century portrait plate” could go for as little as $35, while a plate comparable to the this one that has been properly identified as the work of one of the better makers could sell at auction for more than $600. The first step is to look for a country-of-origin marking, such as “Germany.” Such a marking generally indicates a date of manufacture after 1890, as country-of-origin markings became the norm to comply with American trade-tariff laws put in force in 1891. With the United States being the largest growing market during that period, most European makers were very quick to comply. While not a hard and fast rule, it is one way to separate the earlier cabinet plates from the turn-of-the-century varieties. The second step is to look at the company markings. Most companies used several marks over the course of their existence, with each mark indicating dates of use and changes in a company’s ownership. The marks on this plate show it came from Richard Klemm Decorating Studio in Germany from between 1891 and 1914. In some cases there will be more than one stamp, which is very confusing to the novice collector. All it means is that a plate with two stamps was originally made as an undecorated blank by one company and decorated by another. The marking in green usually indicates the maker, the other marking is that of the company that decorated of the piece. When we examine the marking on our demonstration plate we see it does have a country-of-origin marking, indicating a date post-1890. Checking reference sources such as Worthpoint’s marks library, we find this mark was used by the Richard Klemm Decorating Studio, whose decorating style was similar to that of the Meissen. This particular mark used by the studio circa 1891 to 1914. Once a marking has been identified, the rest of the puzzle falls into place. Digging a little deeper about the owner of the marking by using both print and online reference sources for 19th-century pottery and porcelain, we find that the Klemm studio was founded by Karl Richard Klemm in Dresden, Germany, in 1869. His studio was one of many in Dresden during this late Victorian period. There were more than 40 studios in the Dresden area that specialized in the painting of porcelain in the Meissen style. 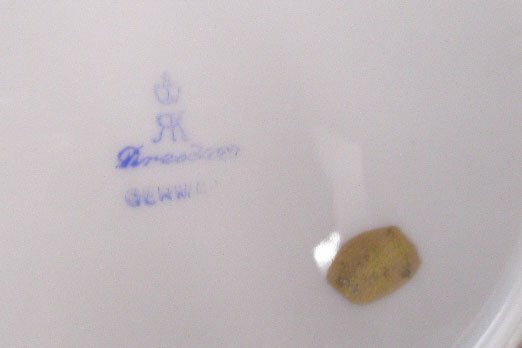 The porcelain blanks themselves often were obtained from the Meissen factory itself, some of them as “seconds.” In many instances, the porcelain decorated by Richard Klemm has the blanks-maker’s marks covered, as can be seen in the image, the mark covered with a gold leaf blob. Mike Wilcox, of Wilcox & Hall Appraisers, is a Worthologist who specializes in Art Nouveau and the Arts and Craft movement. It’s all in the Marks: What Does ‘OEPIAG/EPIAG’ Mean?